Porsche’s race car lineup based on the latest 991-series 911 is complete following this weekend’s introduction of the all-new 911 GT3 R, which sits between the 911 GT3 Cup and 911 RSR in Porsche’s 911 race car hierarchy. The latest model made its debut on the eve of the 2015 Nürburgring 24 Hours race, which at the time of writing is in full action. The new GT3 R is derived from the 911 GT3 RS road car, which itself was launched only a couple of months ago. As its name suggests, the car has been designed for GT3 competition, with the main focus for the engineers being in the areas of lightweight design, aerodynamic efficiency, reduced fuel consumption, improved handling, improved safety and lowering service and spare parts costs. Powering the car is a 4.0-liter flat-six that’s largely identical to the unit in the GT3 RS road car. Power levels offered by the engine start in excess of 500 horsepower. 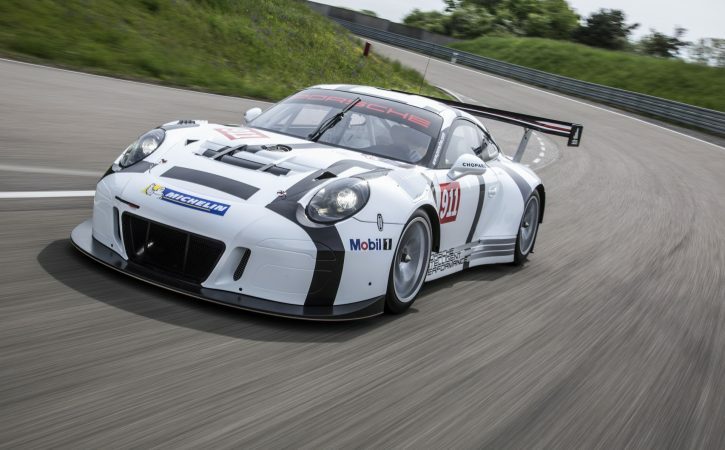 Compared to the engine in the previous GT3 R, the new one offers improved driveability thanks to a flatter torque curve spread over a broader rev range. Power is sent to the rear wheels via a six-speed sequential gearbox with paddle shifters. A mechanical limited-slip differential is also fitted. The wheels measure 18 inches in diameter and come wrapped in massive 300/650 tires up front and 310/710s at the rear. The brakes are ventilated and grooved steel discs with six-piston calipers at the front and four-piston biters at the rear. The suspension consists of McPherson struts, adjustable in height, camber and toe, at the front. An independent multi-link setup, also with adjustable height, camber and toe, is used at the rear. Adjustable anti-roll bars are found at both ends. For the body, lightweight solutions enabled the engineers to significantly optimize the center of gravity of the car compared to the predecessor model. The main body is made with aluminum, steel and composite materials while other parts are pure carbon fiber-reinforced plastic. All windows—and for the first time even the windscreen—comprise of polycarbonate. The end result is a weight of just 2,689 pounds. Another development focus was on the safety features of the GT3 R. The capacity of the further-reinforced FT3 safety fuel cell was increased to 31.7 gallons, with the tank now featuring a fuel cut-off safety valve. The doors and the side windows can be removed, and the escape hatch in the roof is now larger. In the event of an accident, the single racing bucket seat offers the driver even better protection. The new GT3 R will start competing in the 2016 motorsport season and the first teams should receive their cars this December. Pricing is set at 429,000 euros ($491,077) before taxes.